The Interactive RBR provides the evidence and resources for the items in the RBR. Evidence summary: Summary of current evidence on this item as outlined in RBR Resource Pages 1 – 4. One can link to guidelines and parent resources organized by topic. Parent resources: web links to reliable resources on this item. Important: Corrected age should be used at least until 24 to 36 months of age for premature infants born at < 37 weeks gestation. Breastfeeding: Exclusive breastfeeding is recommended for the first six months of life for healthy term infants. Introduction of solids should be led by the infant’s signs of readiness – a few weeks before to just after 6 months. Breast milk is the optimal food for infants, and breastfeeding (with complementary foods) may continue for up to two years and beyond unless contraindicated. Breastfeeding reduces gastrointestinal and respiratory infections and helps to protect against SIDS. Maternal support (both antepartum and postpartum) increases breastfeeding and prolongs its duration. Early and frequent mother-infant contact, rooming in, and banning handouts of free infant formula increase breastfeeding rates. Vitamin D supplementation of 400 IU/day (800 IU/day in high-risk infants) is recommended for infants/children for as long as they are breastfed. Breastfeeding mothers should continue to take Vitamin D supplements for the duration of breastfeeding. Infant formula: Discourage the use of homemade infant formulas. Milk consumption range is consensus only & is provided as an approximate guide. Children < 13 years should sit in the rear seat. Keep children away from all airbags. Install and follow size recommendations as per specific car seat model and keep child in each stage as long as possible. Use rear-facing infant/child seat that is manufacturer approved for use until at least age 2 years. Use forward-facing child seat after 2 years for as long as manufacturer specifications will allow. After this, use booster seat for children 18-36 kg (40-80 lbs) and up to 145 cm (4’9”). Use lap and shoulder belt in the rear middle seat for children over 8 years who are at least 36 kg (80 lb) and 145 cm (4’ 9”) and fit vehicle restraint system. Burns: Install smoke detectors in the home on every level. Keep hot water at a temperature < 49oC. Bath safety: Never leave a young child alone in the bath. Do not use infant bath rings or bath seats. Water safety: Recommend adult supervision, training for adults, 4-sided pool fencing, lifejackets, swimming lessons, and boating safety to decrease the risk of drowning. Sleep position, bed sharing and SIDS: Healthy infants should be positioned on their backs for sleep. Counsel parents on the dangers of other contributory causes of SIDS such as bed sharing, overheating, maternal smoking or second-hand smoke. Positional plagiocephaly: While supine for sleep, the orientation of the infant’s head should be varied to prevent positional plagiocephaly. Sleep positioners should not be used. After umbilical cord stump has detached, infants should have supervised tummy time while awake. Crib safety/Room sharing: Infants should sleep in a crib, cradle or bassinette, without soft objects, loose bedding and similar items that meet current 2016 Health Canada regulations in parents’ room for the first 6 months of life. Room sharing is protective against SIDS. Crying: Excessive crying may be caused by behavioural or physical factors or be the upper limit of the normal spectrum. Caregiver frustration with infant crying can lead to child maltreatment/inflicted injury (head injury, fractures, bruising). The Period of Purple Crying. See Prevention of child maltreatment. Parent (low socio-economic status, maternal age < 19 years, single parent family, non-biological parents, abused as child, substance abuse, lack of social support, unplanned pregnancy or negative parental attitude towards pregnancy). Family (spousal violence, poor marital relations, poor child-parent relationship, unhappy family life). Discuss with parents of preschoolers teaching names of genitalia, appropriate and inappropriate touch, and normal sexual behaviour for age. Exposure to personal violence and other forms of violence has significant impact on physical and emotional well-being of children. Assess home visit need: There is good evidence for home visiting by nurses during the perinatal period through infancy for first-time mothers of low socioeconomic status, single parents or teenaged parents to prevent physical abuse and/or neglect. Assess healthy sleep habits: Normal sleep (quality and quantity for age) is associated with normal development and leads to better health outcomes. Sleeping Behaviour (EECD). Second-hand smoke exposure: There is no safe level of exposure. Advise caregivers to stop smoking and/or reduce second-hand smoke exposure, which contributes to childhood respiratory illnesses, SIDS and neuro-behavioural disorders. Offer smoking cessation resources. Sun exposure/sunscreens/insect repellents: Minimize sun exposure. Wear protective clothing, hats, properly applied sunscreen with SPF ≥ 30 for those > 6 months of age. No DEET in < 6 months; 6–24 months 10% DEET apply max once daily; 2–12 years 10% DEET apply max TID. Complementary and alternative medicine (CAM): Questions should be routinely asked on the use of homeopathy and other complementary and alternative medicine therapy or products, especially for children with chronic conditions. Fever advice/thermometers: Fever ≥ 38°C in an infant < 3 months needs urgent evaluation. Ibuprofen and acetaminophen are both effective antipyretics. Acetaminophen remains the first choice for antipyresis under 6 months of age; thereafter ibuprofen or acetaminophen may be used. Alternating acetaminophen with ibuprofen for fever control is not recommended in primary care settings as this may encourage fever phobia, and the potential risks of medication error outweigh measurable clinical benefit. Fontanelles –The posterior fontanelle is usually closed by 2 months and the anterior by 18 months. Check Red Reflex for serious ocular diseases such as retinoblastoma and cataracts. Corneal light reflex/cover–uncover test & inquiry for strabismus: With the child focusing on a light source, the light reflex on the cornea should be symmetrical. Each eye is then covered in turn, for 2–3 seconds, and then quickly uncovered. The test is abnormal if the uncovered eye “wanders” OR if the covered eye moves when uncovered. Check visual acuity at age 3–5 years. Hearing inquiry/screening – Any parental concerns about hearing acuity or language delay should prompt a rapid referral for hearing assessment. Formal audiology testing should be performed in all high-risk infants, including those with normal UNHS. Older children should be screened if clinically indicated. 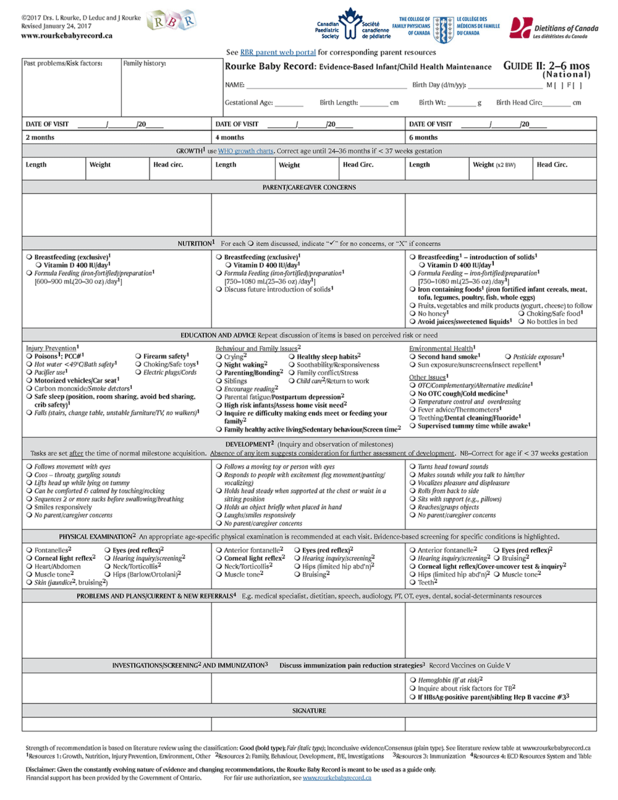 Muscle tone – Physical assessment for spasticity, rigidity, and hypotonia should be performed. Bruising: Unexplained bruising warrants evaluation re child maltreatment or medical illness. Avoid honey until 1 year of age to prevent botulism. Avoid all sweetened fruit drinks, sport-drinks, energy drinks and soft-drinks; restrict fruit juice consumption to a maximum of 1/2 cup (125 mL) per day. Poisons: Keep medicines and cleaners locked up and out of child’s reach. Have Poison Control Centre number handy. Use of ipecac is contraindicated in children. Pesticides: Avoid pesticide exposure. Encourage pesticide-free foods. Dental Cleaning: As excessive swallowing of toothpaste by young children may result in dental fluorosis, children under 3 years of age should have their teeth and gums brushed twice daily by an adult using either water (if low risk for tooth decay) or a rice grain sized portion of fluoridated toothpaste (if at caries risk). Children 3–6 years of age should be assisted during brushing and only use a small amount (e.g., pea-sized portion) of fluoridated toothpaste twice daily. Caregiver should brush child’s teeth until they develop the manual dexterity to do this alone, and should continue to intermittently supervise brushing after children assume independence. Begin flossing daily when teeth touch. Caries risk factors include: child has caries or enamel defects, hygiene or diet is concerning, parent has caries, premature or LBW infant, or no water fluoridation. To prevent early childhood caries: avoid juices/sweetened liquids and constant sipping of milk or natural juices in both bottle and cup. Fluoride varnish should be used for those at caries risk. Consider dietary fluoride supplements only for high risk children who do not have access to systemic community water fluoridation. 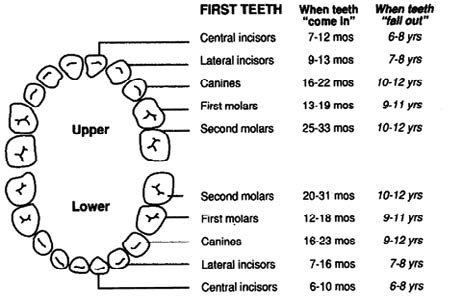 Consider the first dentist visit by 6 months after eruption of 1st tooth or at age 1 year. Dental: Examine for problems including dental caries, oral soft tissue infections or pathology; and for normal teeth eruption sequence. Introduction to solids: A few weeks before to just after 6 months, start iron containing foods to avoid iron deficiency. A variety of soft texture foods, ranging from purees to finger foods, can be introduced. Encourage increased physical activity, with parents as role models, through interactive floor-based play for infants and a variety of activities for young children, and decreased sedentary pastimes. Media use – Counsel on appropriate screen time: < 2 years avoid; 2–4 years < 1 h/day. Less is better. Educational and prosocial programming is better. Encourage parents to read to their children within the first few months of life and to limit TV, video and computer games to provide more opportunities for reading. Inquire about current child care arrangements. High quality child care is associated with improved paediatric outcomes in all children. Factors enhancing quality child care include: practitioner general education and specific training; group size and child/staff ratio; licensing and registration/accreditation; infection control and injury prevention; and emergency procedures. Anemia screening: All infants/children from high-risk groups for iron deficiency anemia require screening between 6 and 18 months of age. E.g. Lower SES; Asian; First Nations children; low-birth-weight and premature infants; infants/children fed whole cow’s milk before 9 months of age or at quantities > 750 mls/day, or if iron containing foods are not provided. INJURY PREVENTION: In Canada, unintentional injuries are the leading cause of death in children and youth. Most of these preventable injuries are caused by motor vehicle collisions, drowning, choking, burns, poisoning, and falls. Unexplained injuries (e.g. fractures, bruising, burns) or injuries that do not fit the rationale provided or developmental stage raise concern for child maltreatment. Jaundice: Bilirubin testing (total and conjugated) if persists beyond 2 wks of age. Neonatal Hyperbilirubinemia Guidelines (CPS) Newborn screening for biliary atresia (AAP). Maneuvers are based on evidence-based literature on milestone acquisition. Evidence-based milestone ages (PCH). They are not a developmental screen, but rather an aid to developmental surveillance. They are set after the time of normal milestone acquisition. Thus, absence of any one or more items is considered a high-risk marker and indicates consideration for further developmental assessment, as does parental or caregiver concern about development at any stage. Hepatitis B vaccine can be routinely given to infants or preadolescents, depending on the provincial/territorial policy. The first dose can be given at 1 month, or at 2 months of age to fit more conveniently with other routine infant immunization visits. The second dose should be administered at least 1 month after the first dose, and the third at least 2 months after the second dose, but again may fit more conveniently into the 4- and 6-month immunization visits. Alternatively, Hep B can be administered as DTaP-IPV-Hib-HepB vaccine in infants, with the first dose at 2 months of age. A two-dose schedule for adolescents is an option. For high-risk children, 3 or 4 doses of higher dose of monovalent hepatitis B vaccine is recommended (immunocompromising conditions, chronic renal failure, dialysis). For infants born to a mother with acute or chronic hepatitis B (HBsAg-positive), the first dose of Hep B vaccine should be given at birth (with Hepatitis B immune globulin, below) and repeat doses of vaccine at 1 and 6 months of age. Premature infants of birthweight less than 2,000 grams, born to HB- infected mothers, require four doses of HB vaccine at 0, 1, 2 and 6 months. The last dose should not be given before 6 months of age. Infants of HBsAg-positive mothers also require Hepatitis B immune globulin at birth and follow-up immune status at 9–12 months for HBV antibodies and HBsAg. Infants with HBsAg-positive fathers, siblings or other household contacts require Hepatitis B vaccine at birth, and at 1 month, and 6 months of age. Children in other high risk groups, if not vaccinated in infancy, should be vaccinated as soon as the risk factor is recognized. See Hepatitis B chapter in the Canadian Immunization Guide for a list of high risk groups. Provincial/territorial immunization schedules may differ based on funding differences. Provincial/territorial immunization schedules are available at the Public Health Agency of Canada. © All Rights Reserved, Office of Professional Development (OPD), Memorial University of Newfoundland.